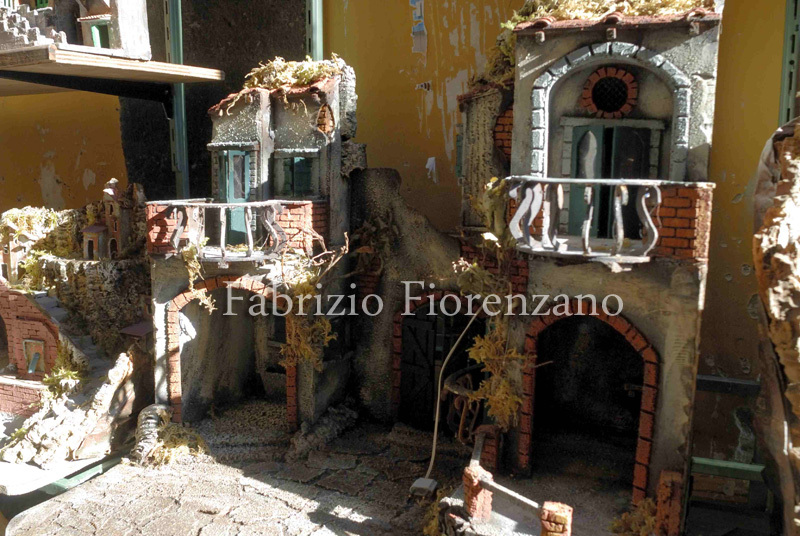 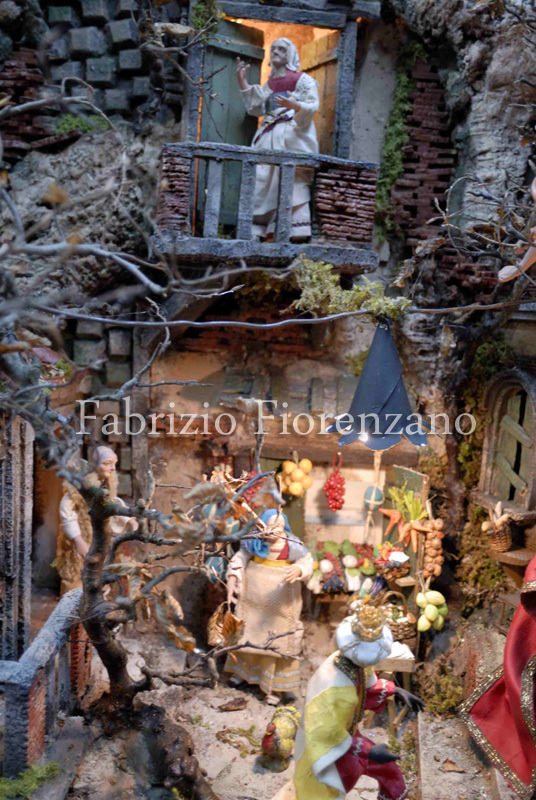 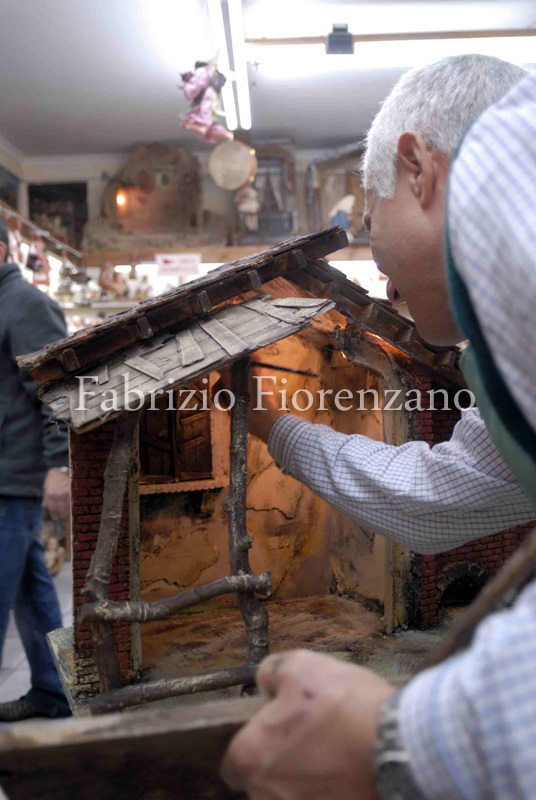 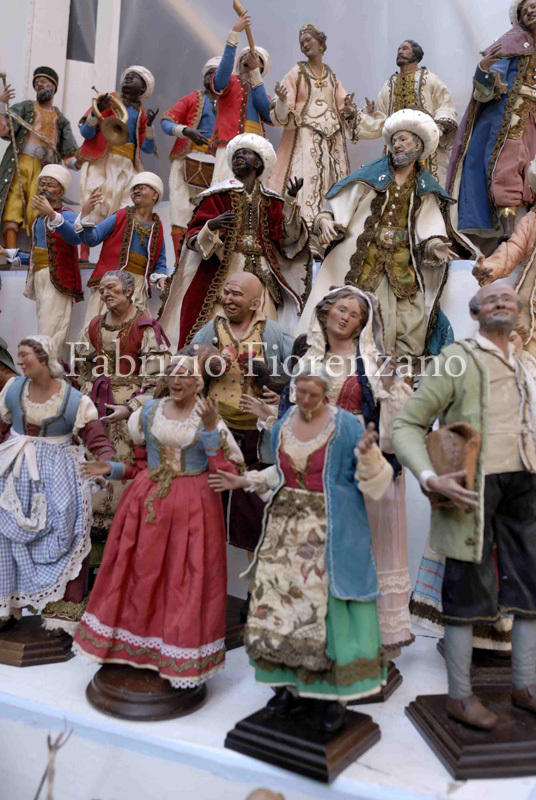 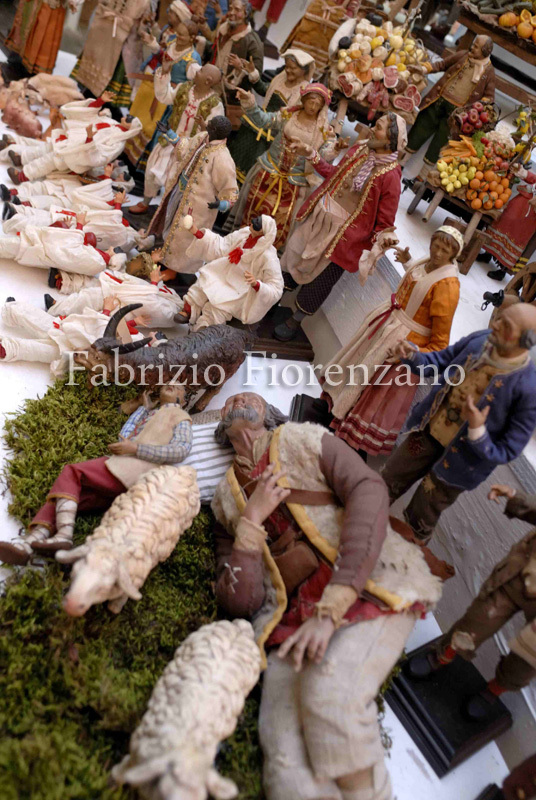 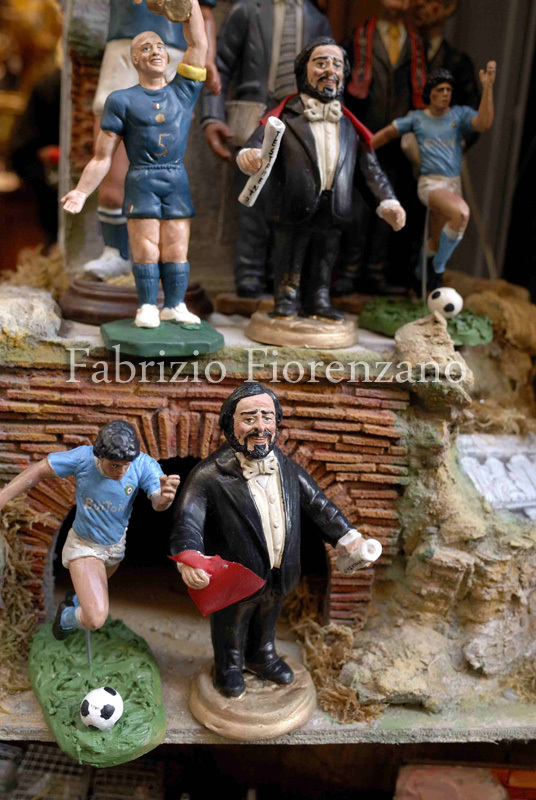 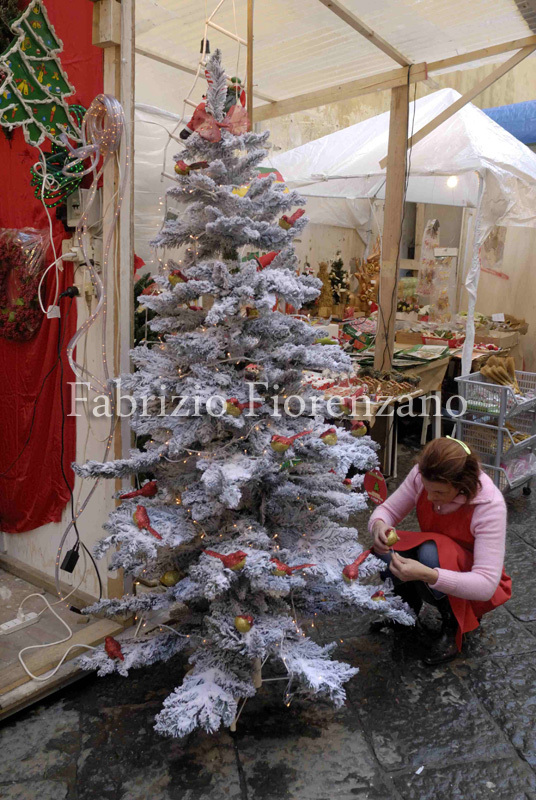 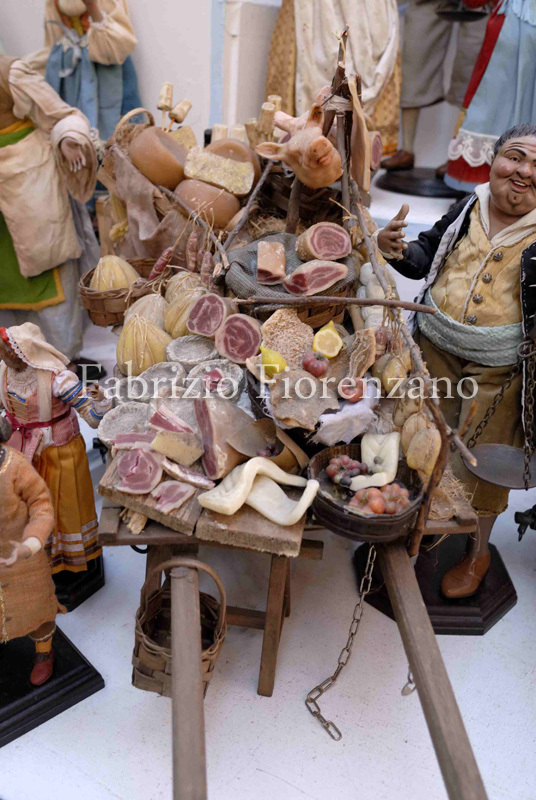 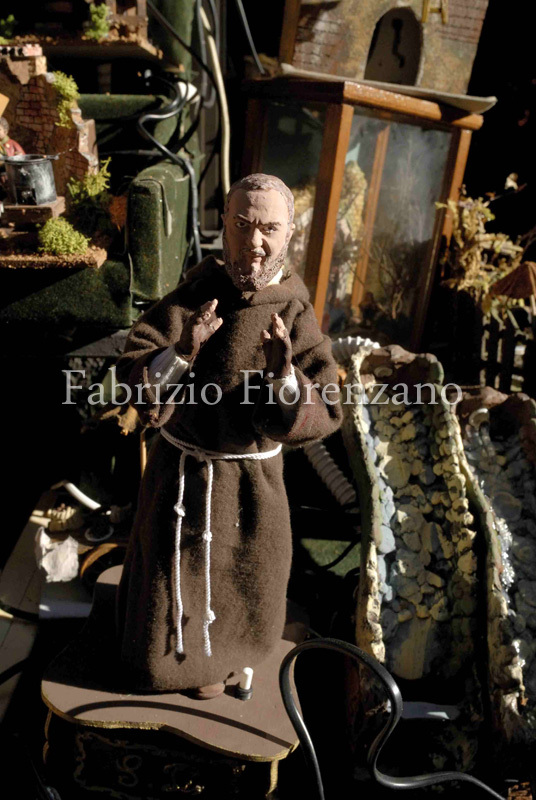 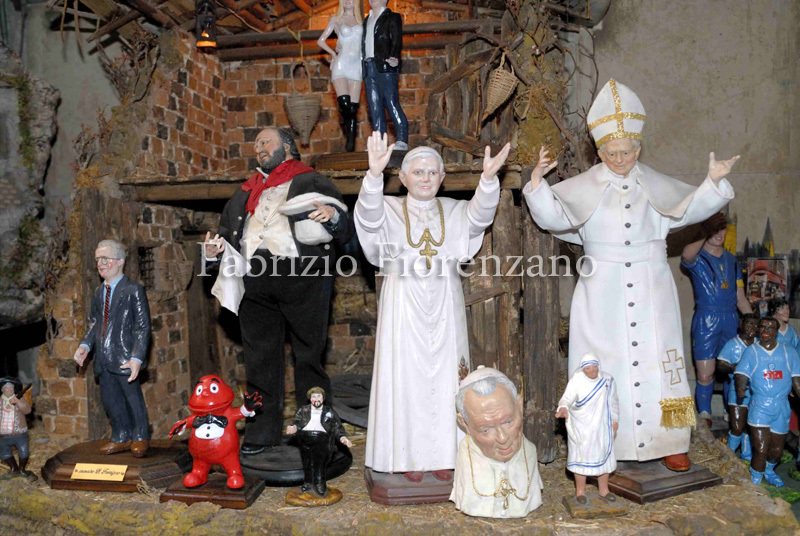 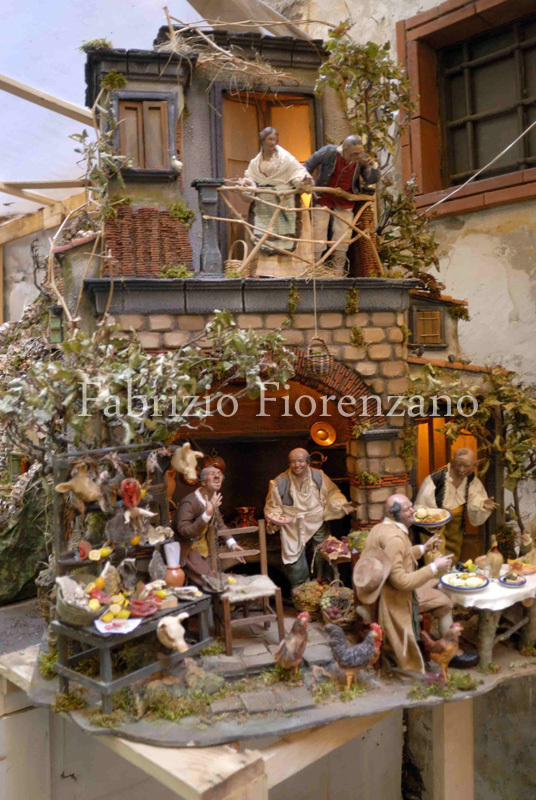 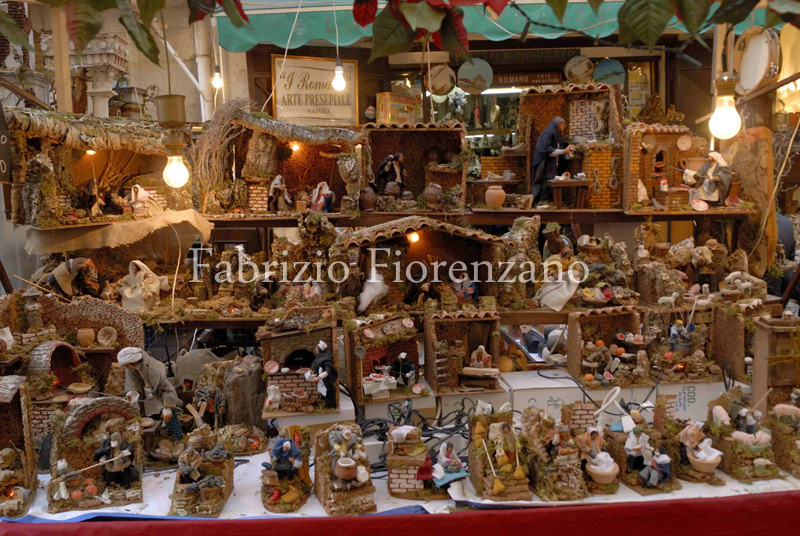 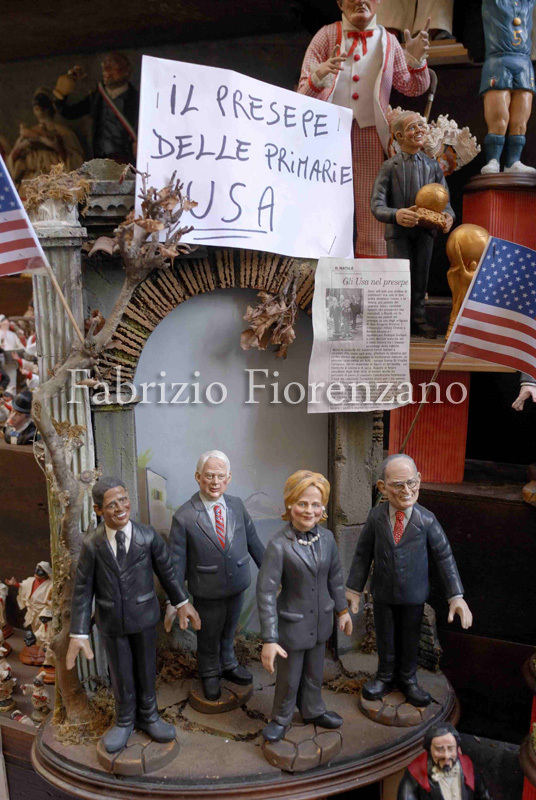 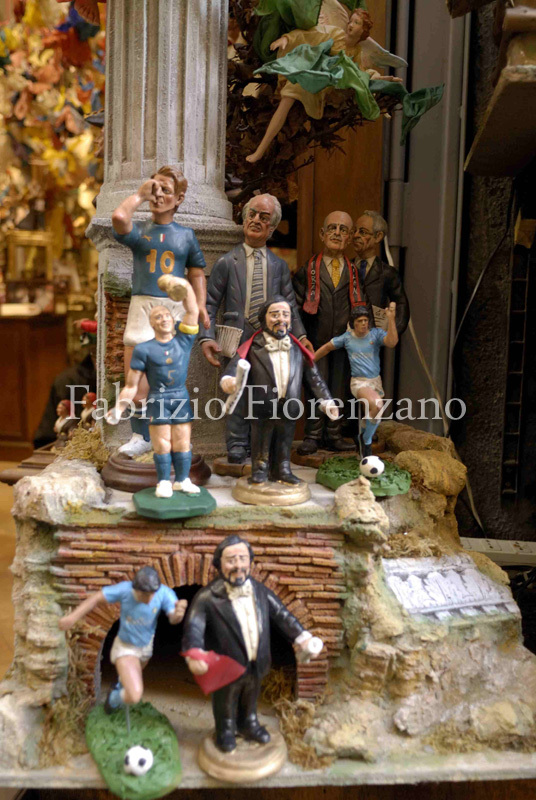 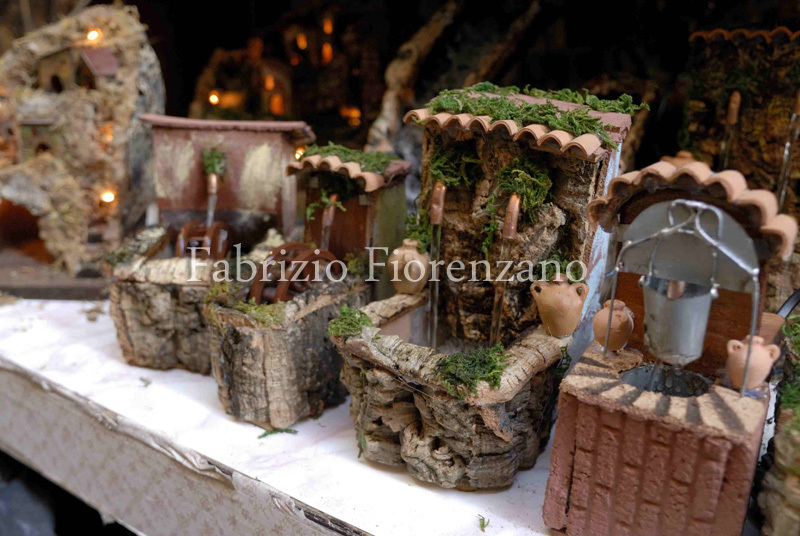 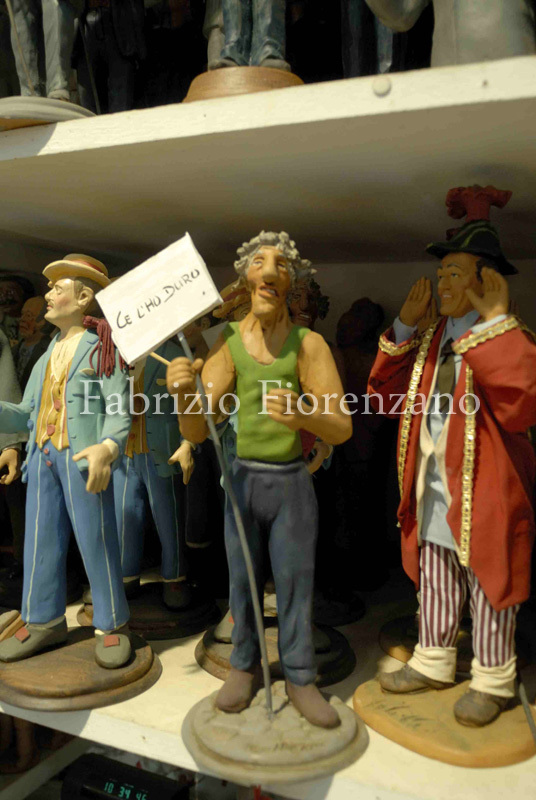 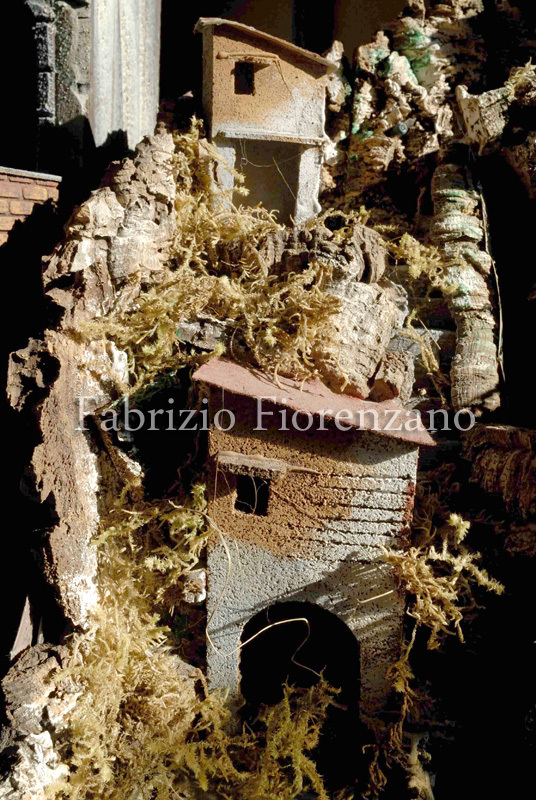 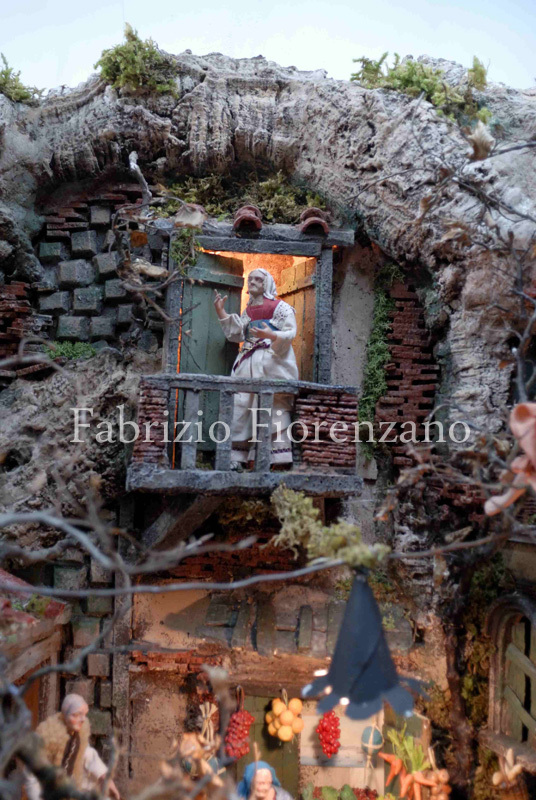 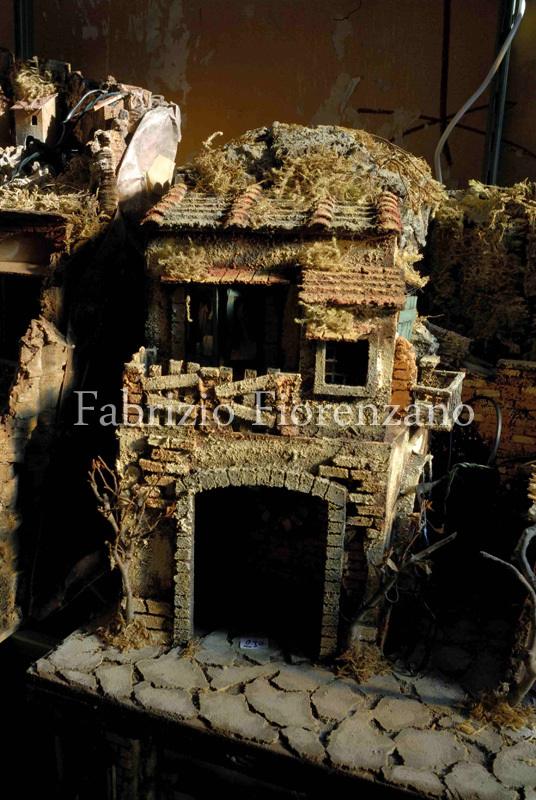 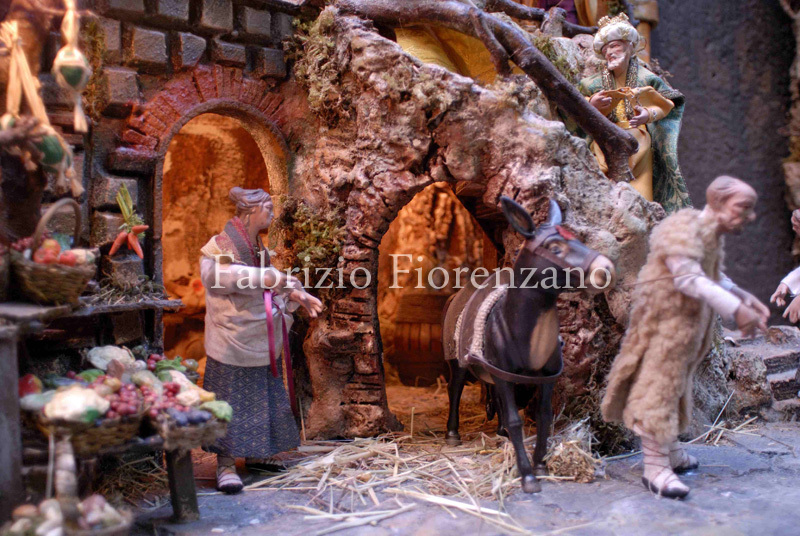 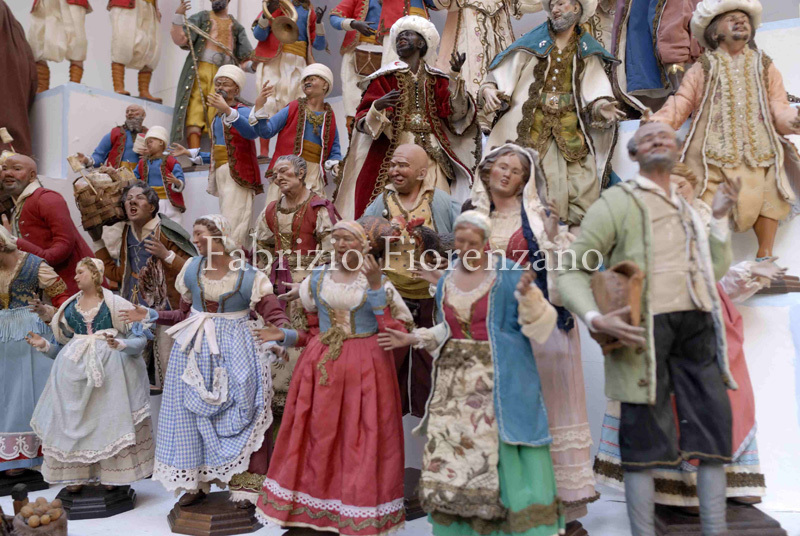 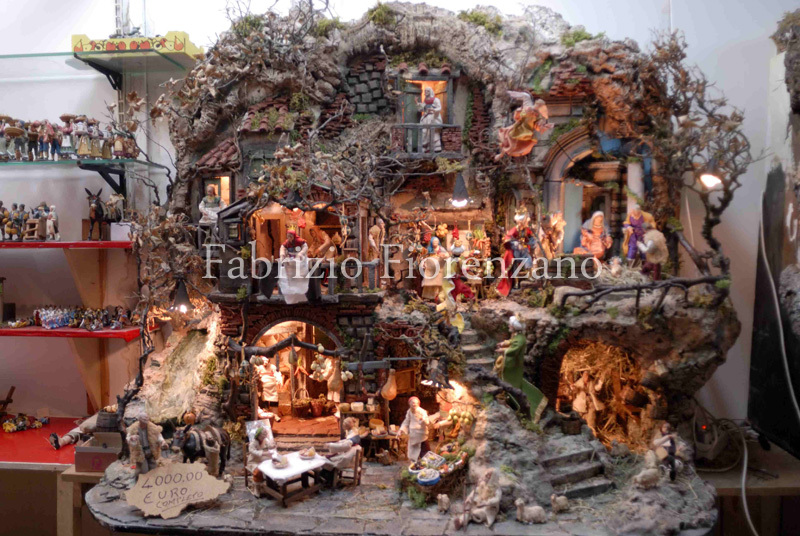 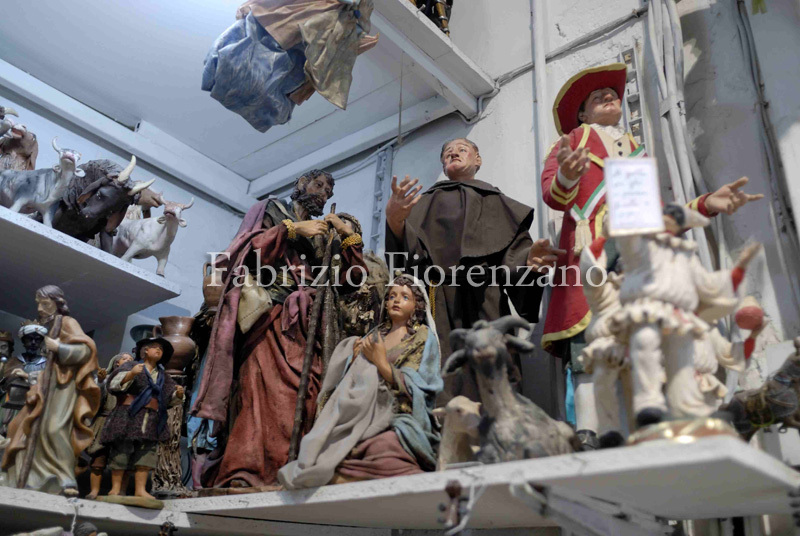 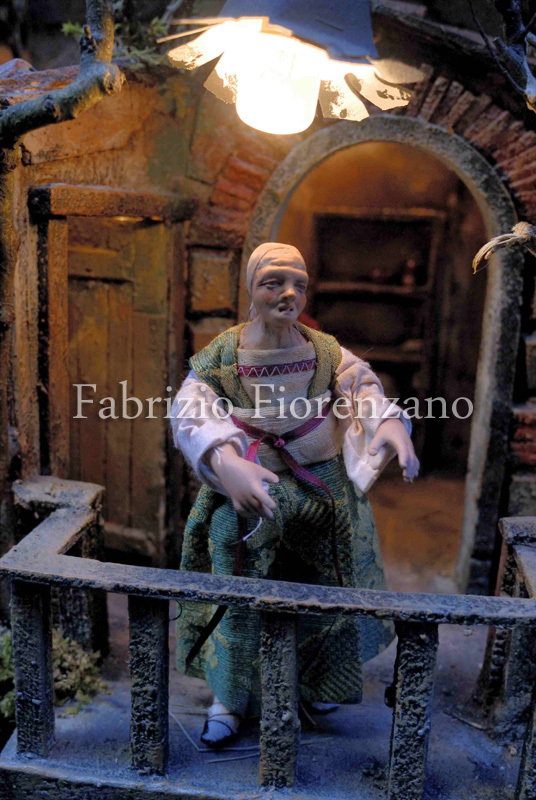 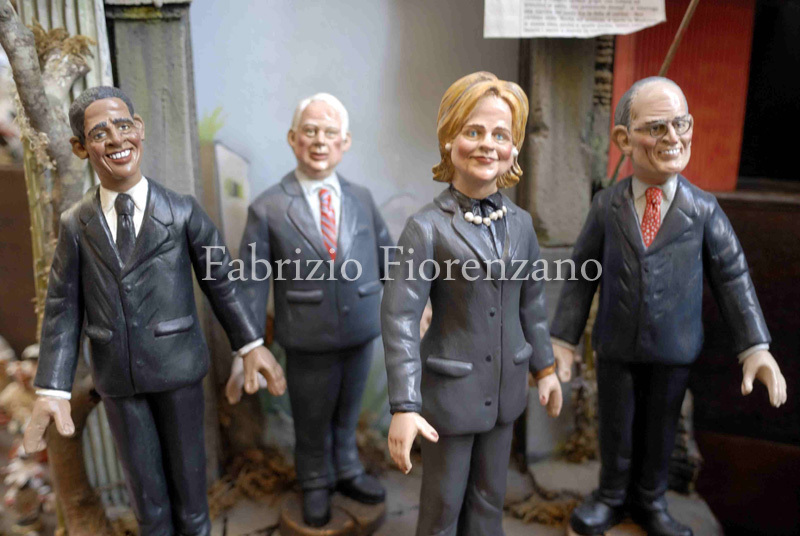 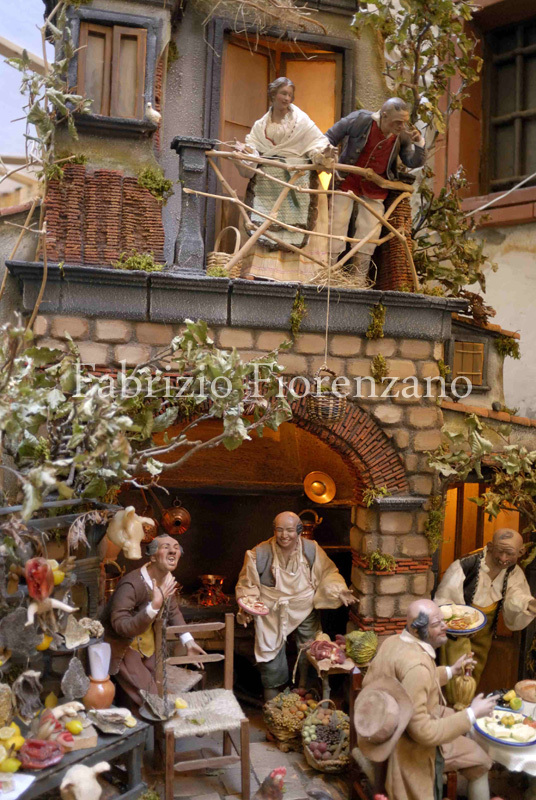 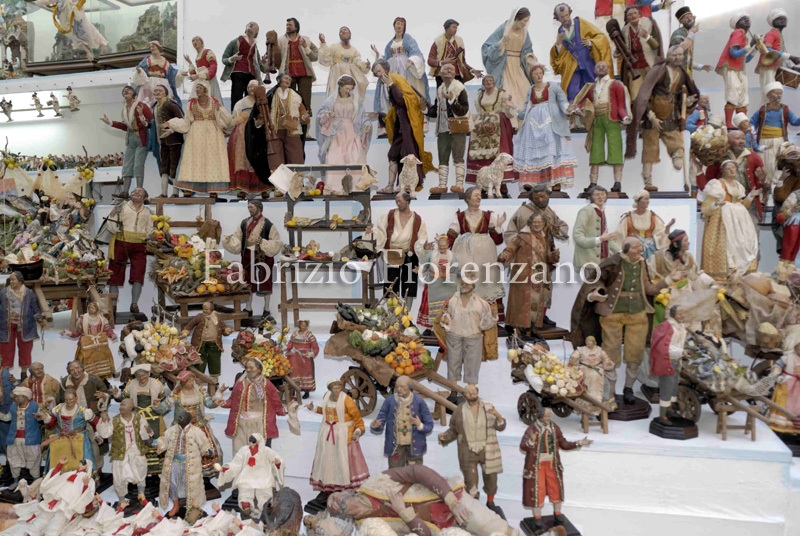 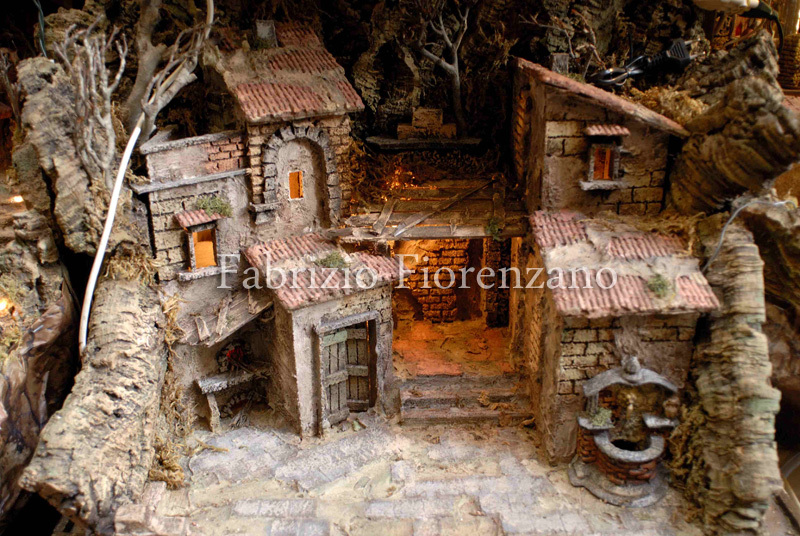 To describe an artistic form or a local tradition may seem easy, but if you have to illustrate what Neapolitan craftsmen of nativity scenes do, then the task can be quite hard. 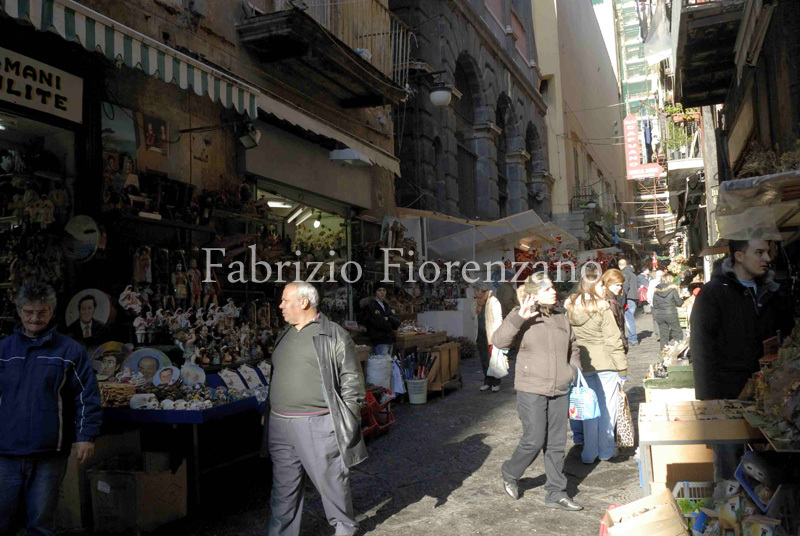 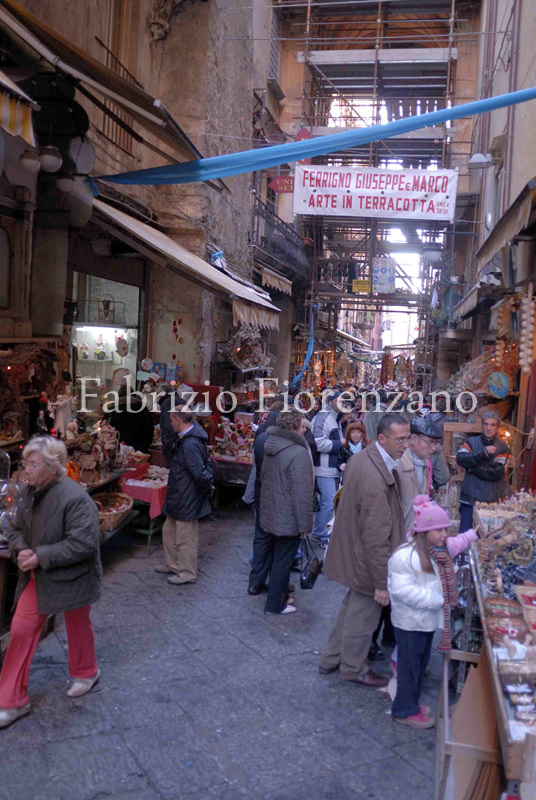 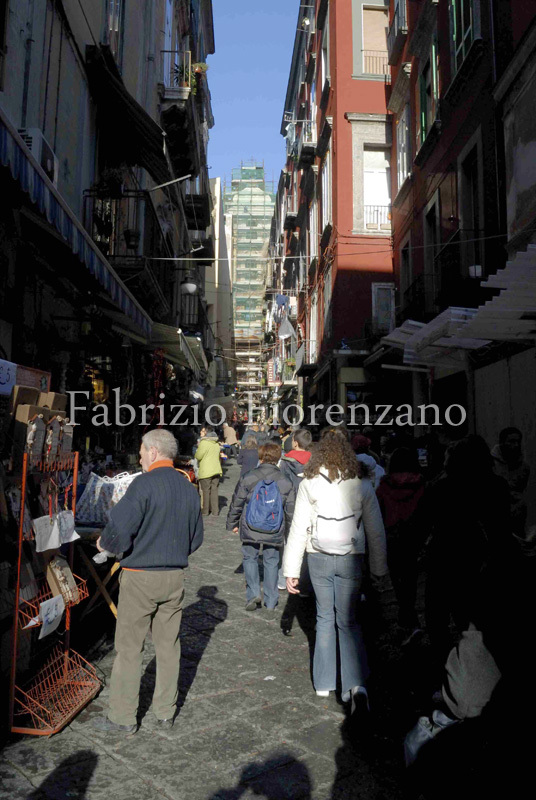 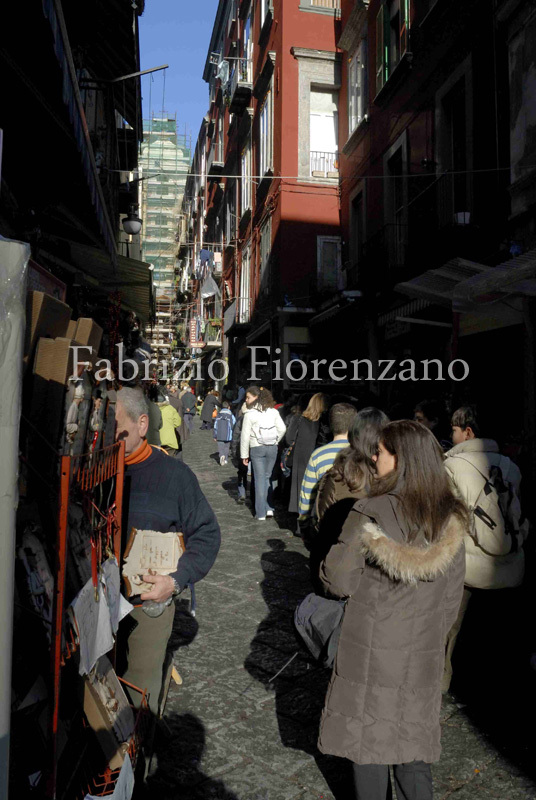 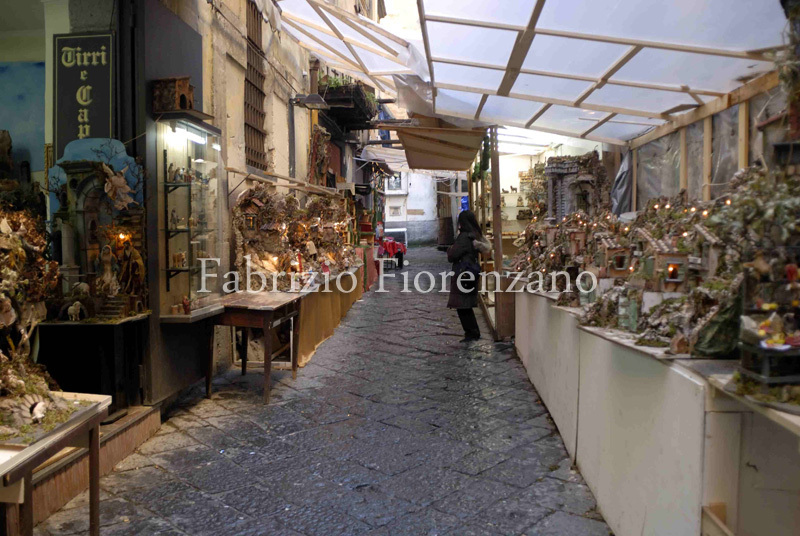 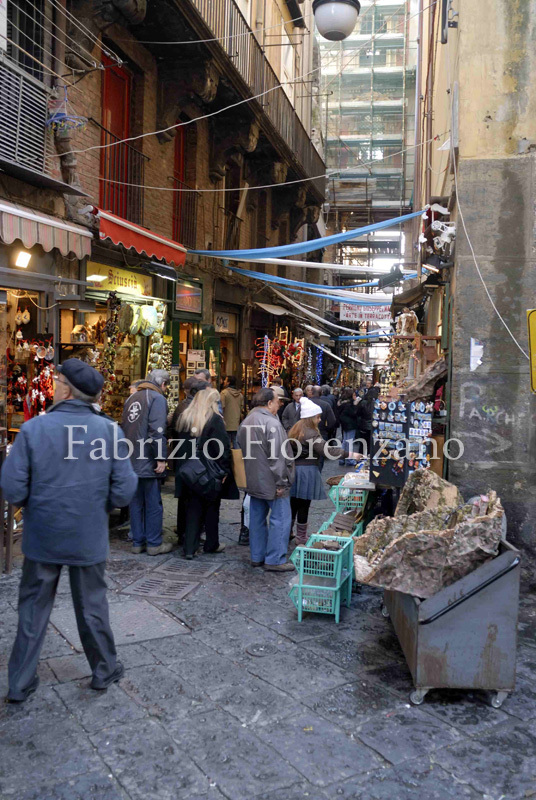 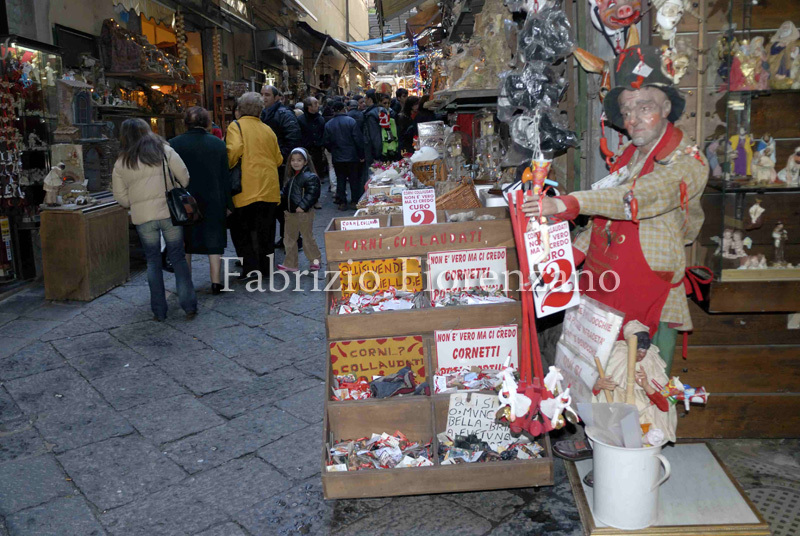 In the heart of Naples, the Decumani district, there is a street that has become famous all over the world: Via San Gregorio Armeno. 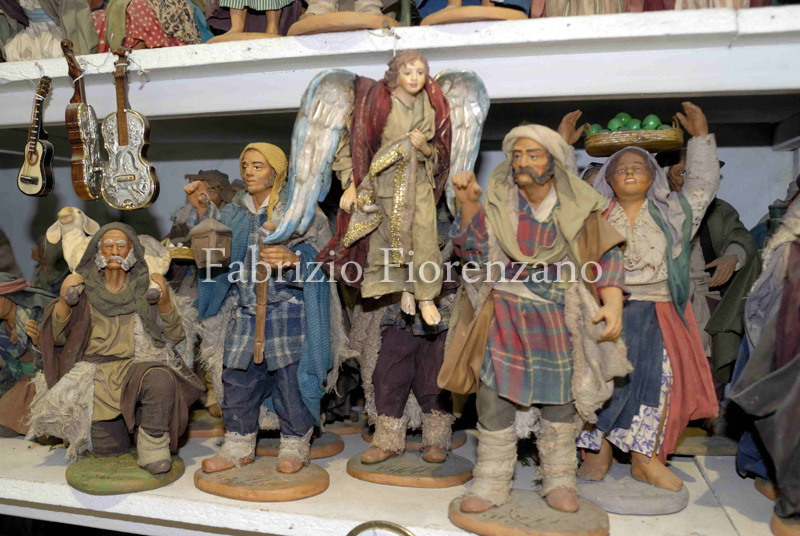 Here from time immemorial, generations of master craftsmen have committed their lives to the creation of nativity scenes and Christmas shepherd figurines. 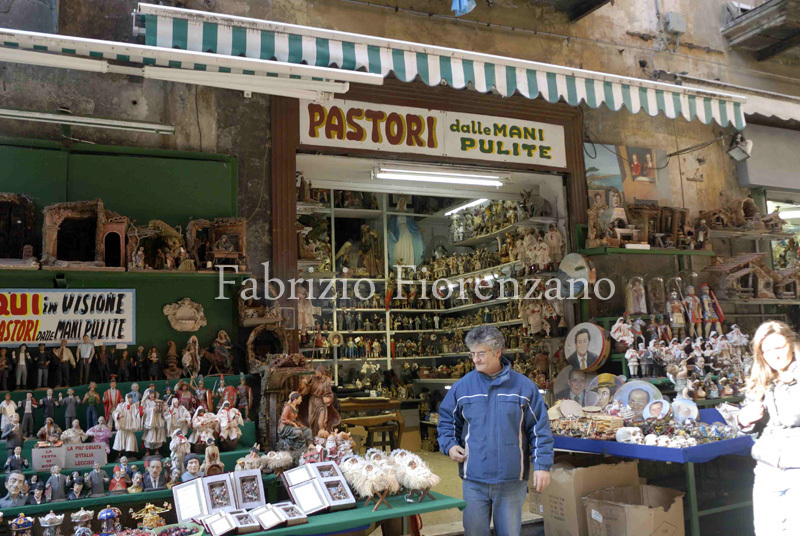 A host of workshops and little shops come one after the other along the road and in the near-by alleys. 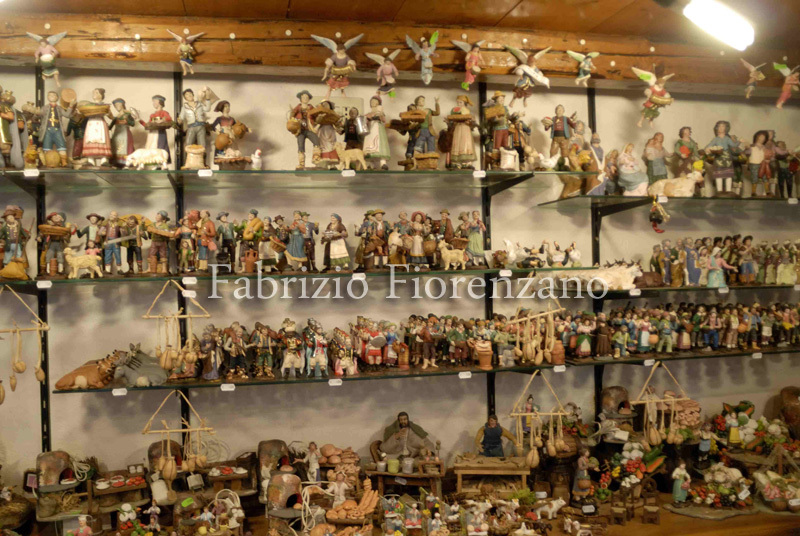 Hundreds of thousands of people, especially tourists from all over Italy and from abroad, admire and are enraptured by the incredible skill of these craftsmen. 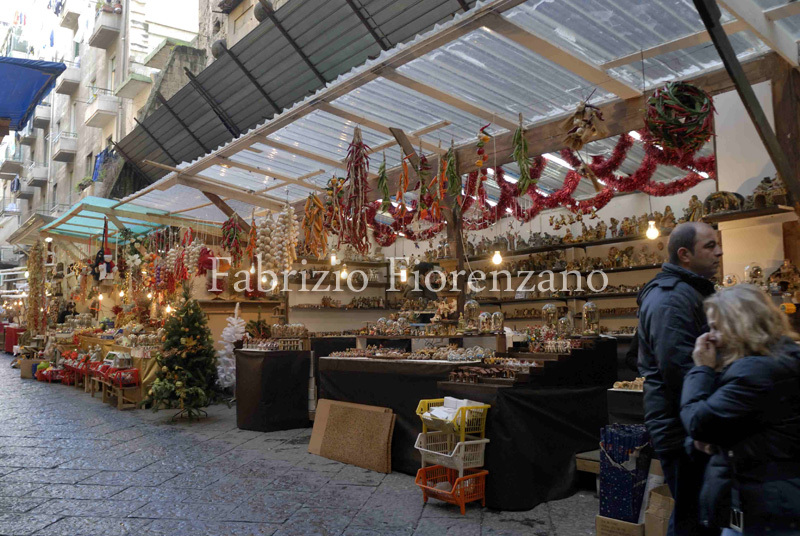 The bright colours from the shops, the stands occupying the street and from the thousands of Christmas items displayed give the place that festive and joyful atmosphere typical of the warm and passionate people from the south. 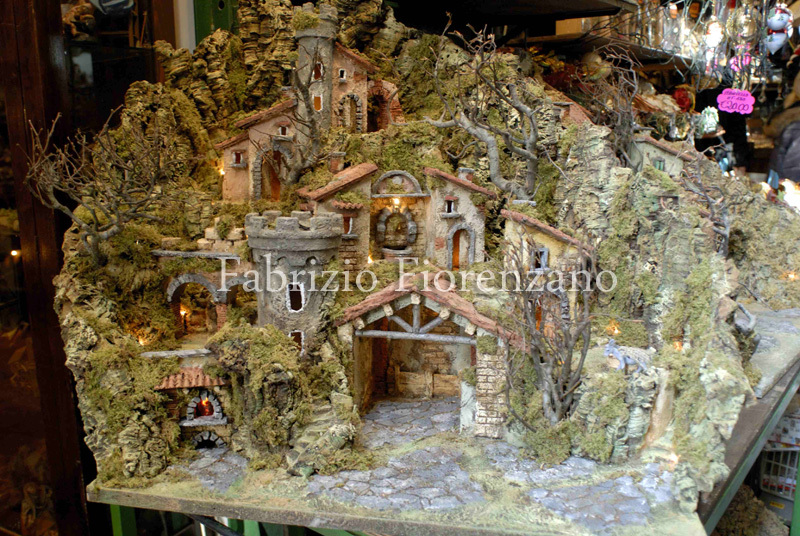 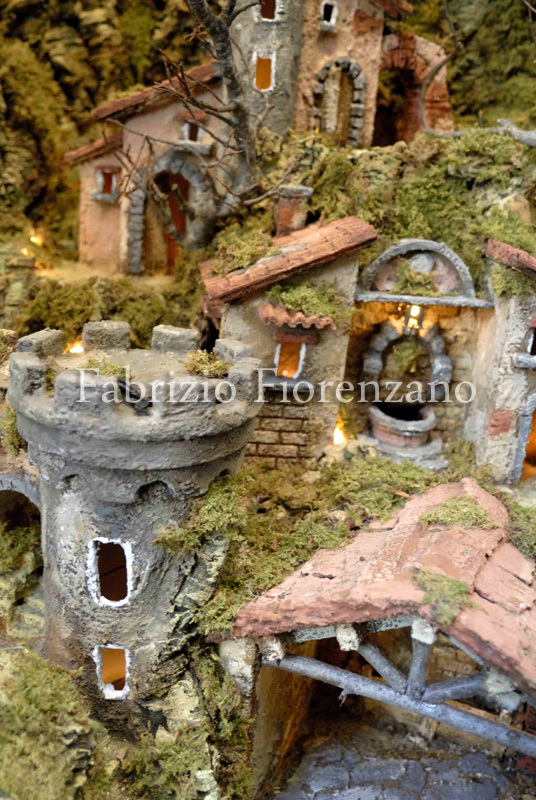 Here you can find all the accessories you need for a nativity scene, even the ones you wouldn’t imagine to find such as little cork or cardboard houses of various sizes, windmills or electronically-activated waterfalls. 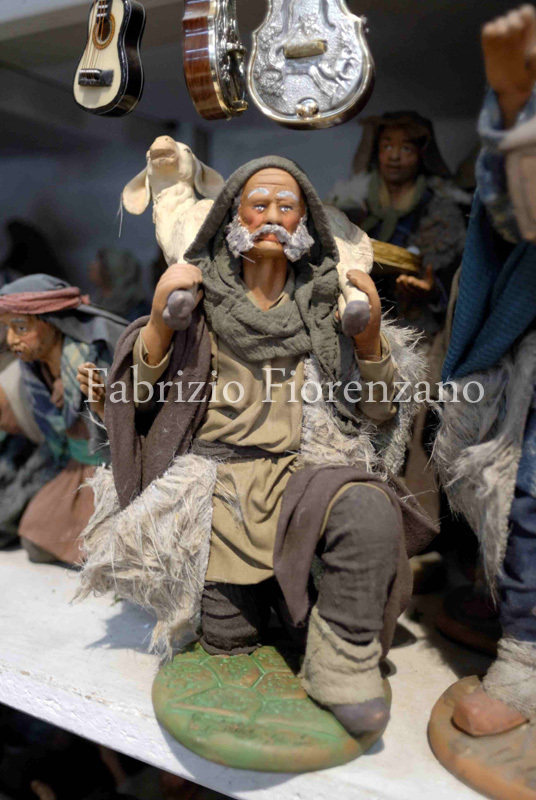 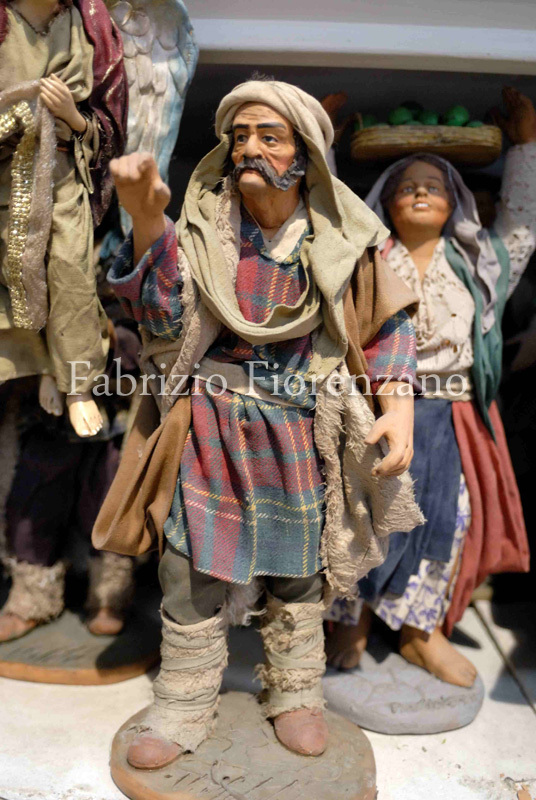 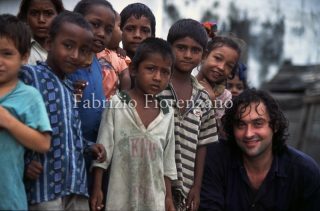 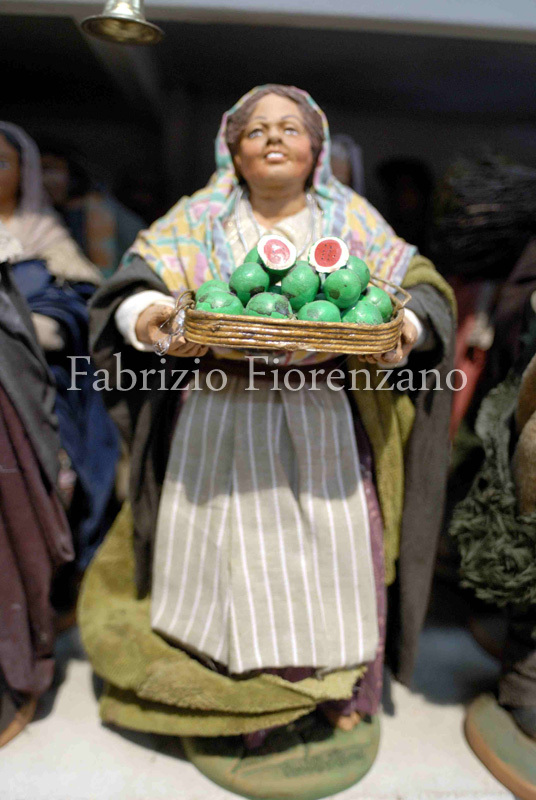 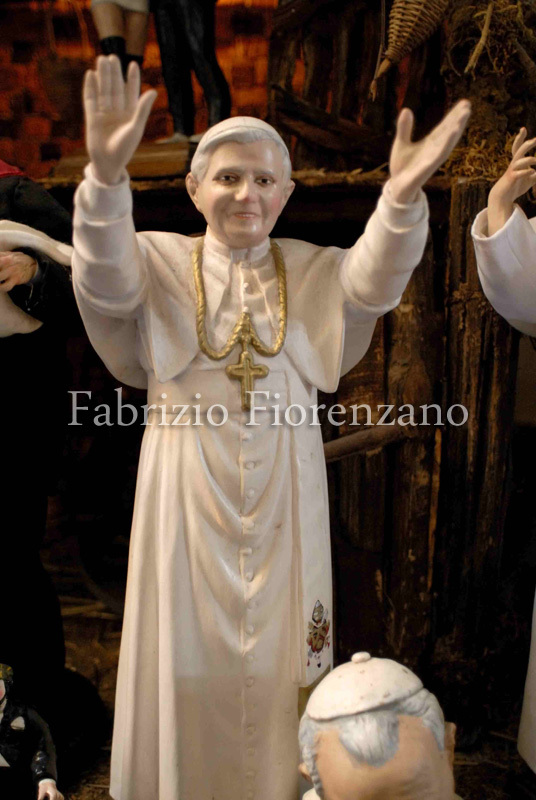 There are clay hand-painted shepherds dressed with real cloths custom-tailored and even wearing shoes that, measuring only a few millimeters, fit perfectly maintaining the body’s proportions. 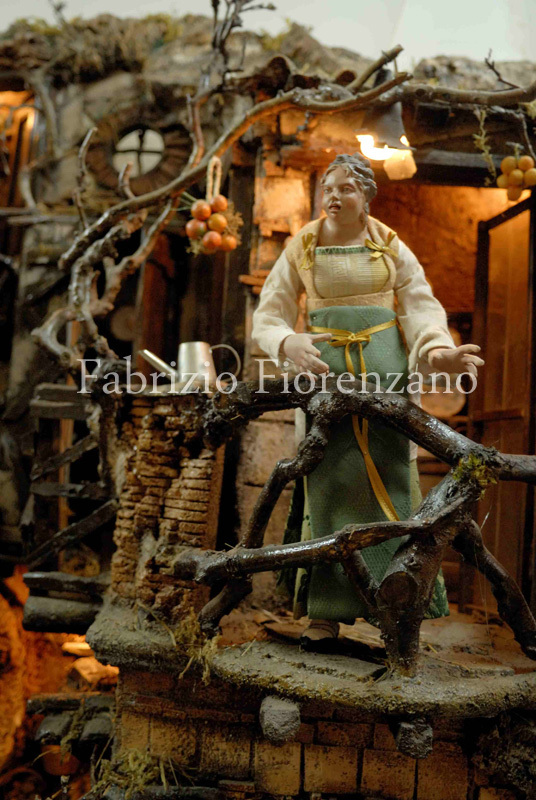 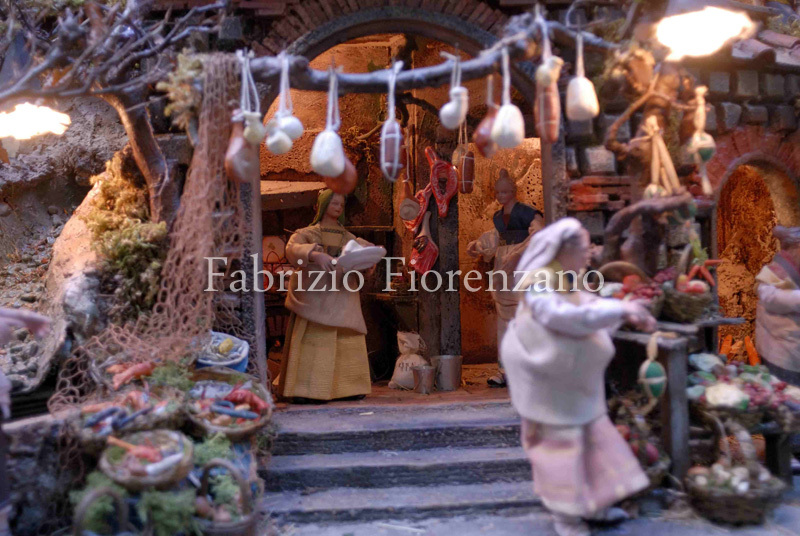 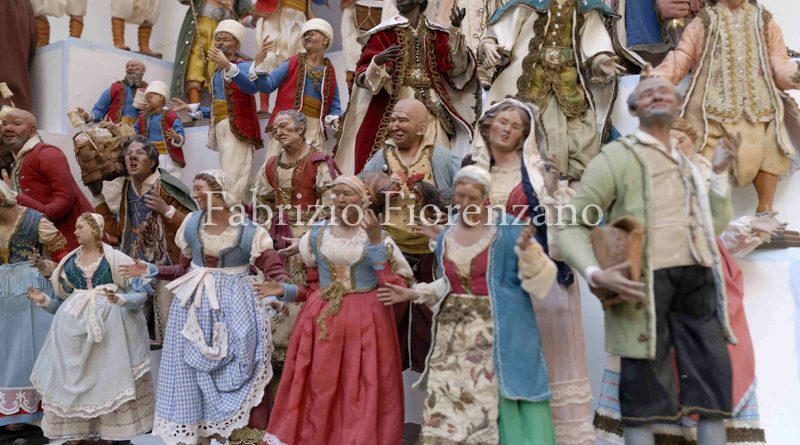 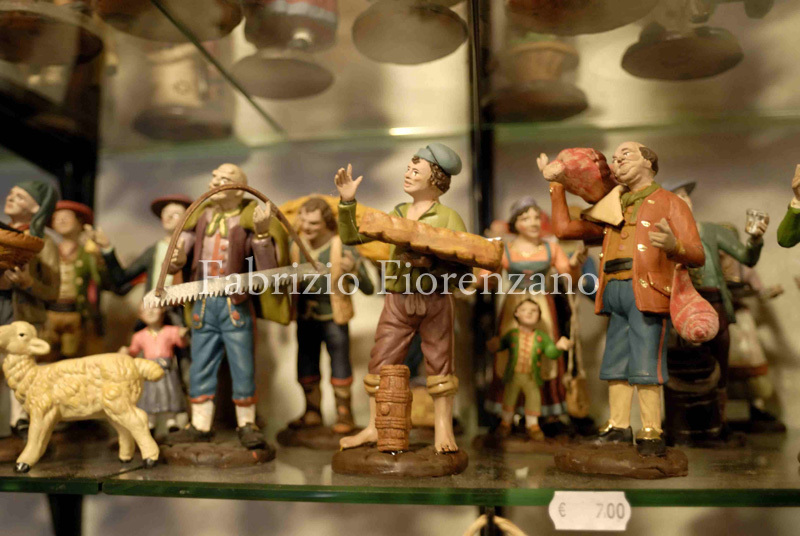 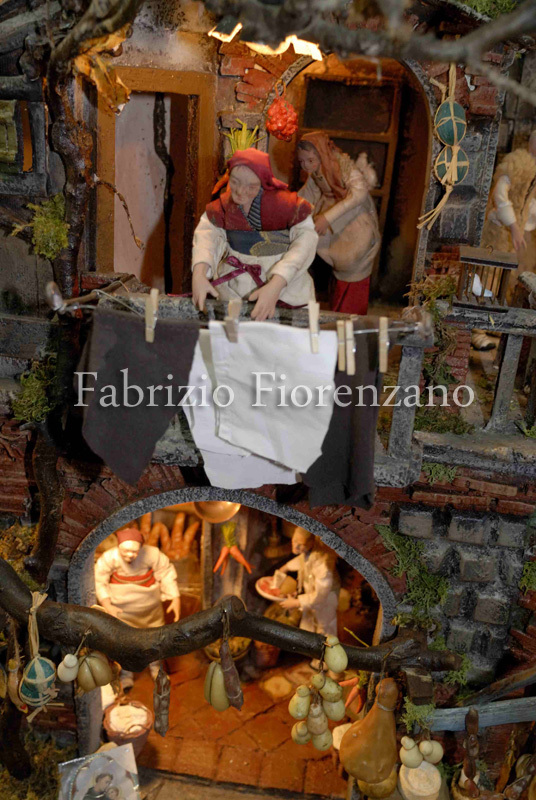 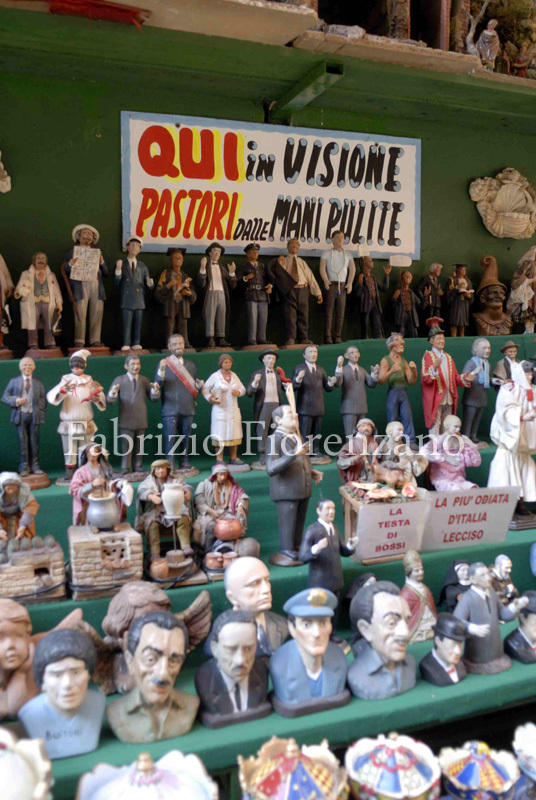 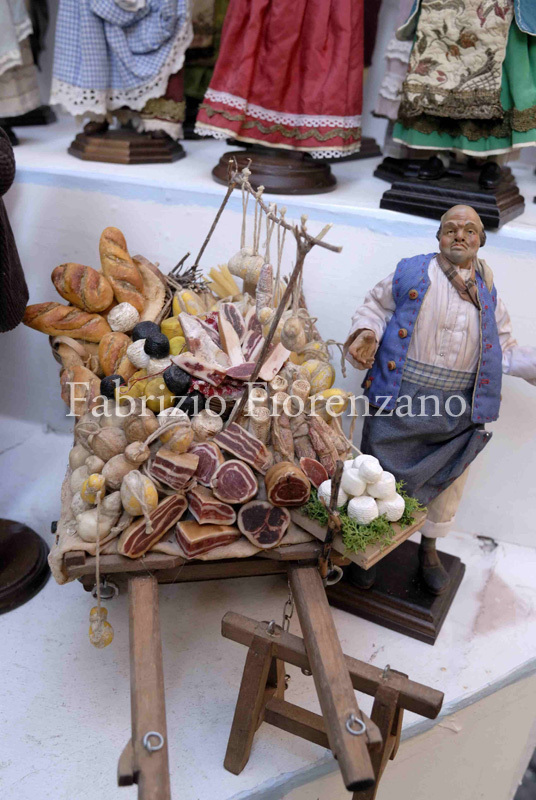 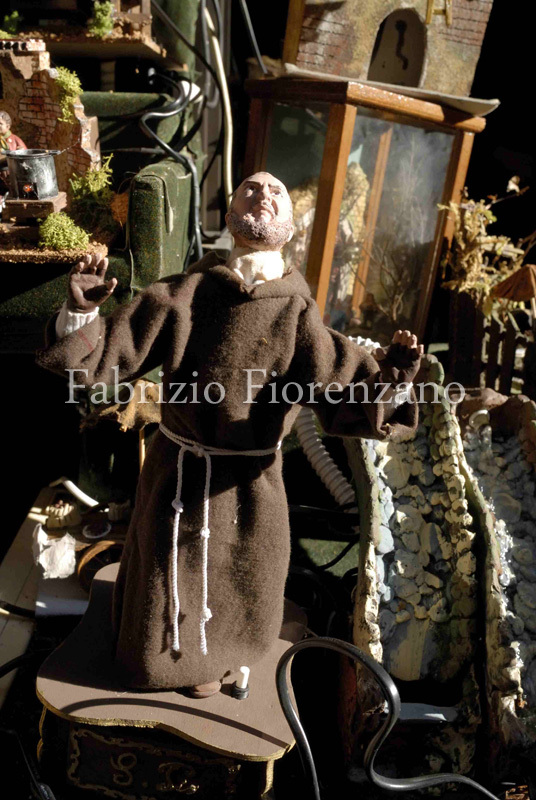 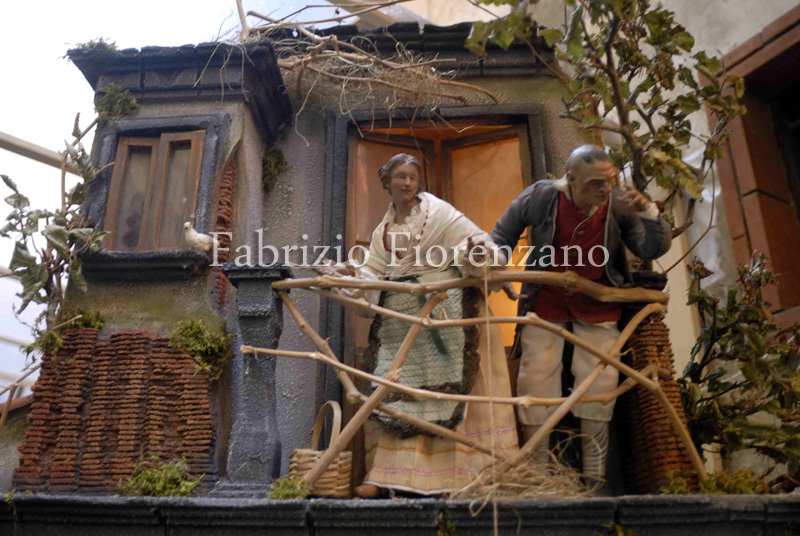 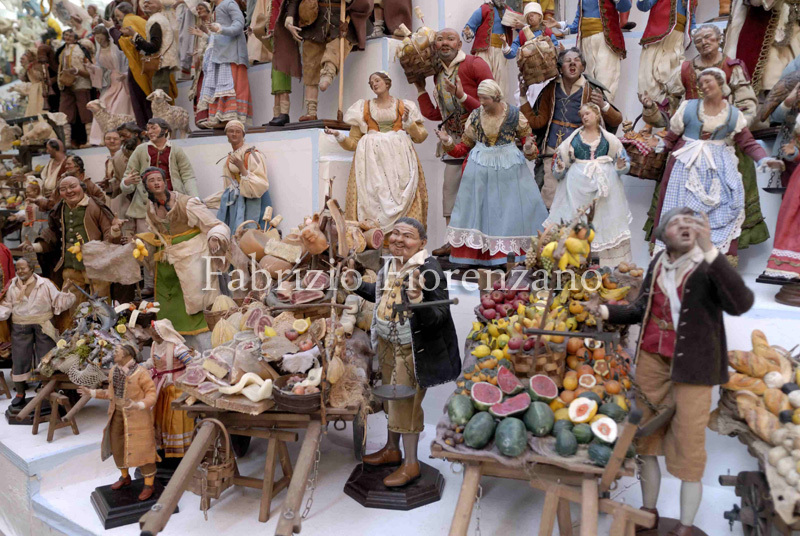 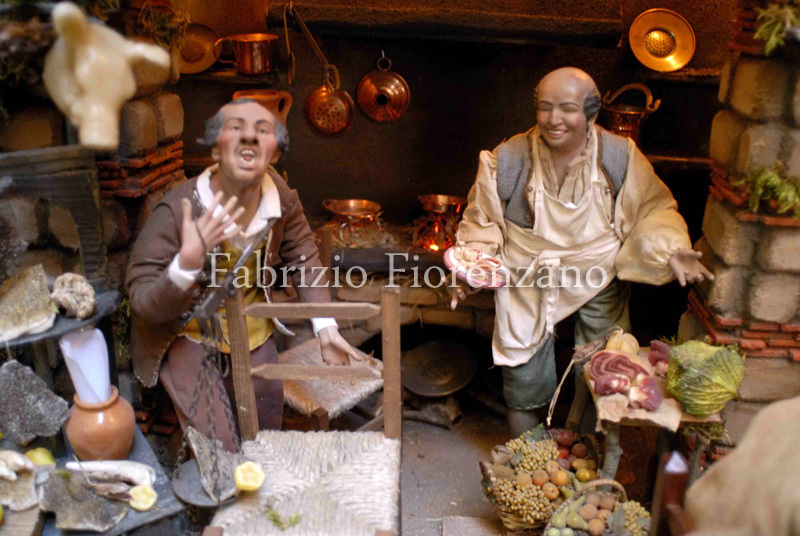 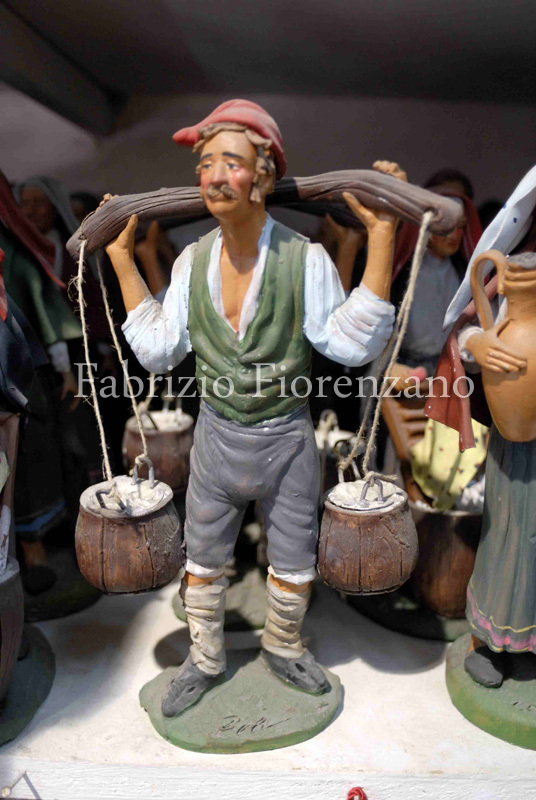 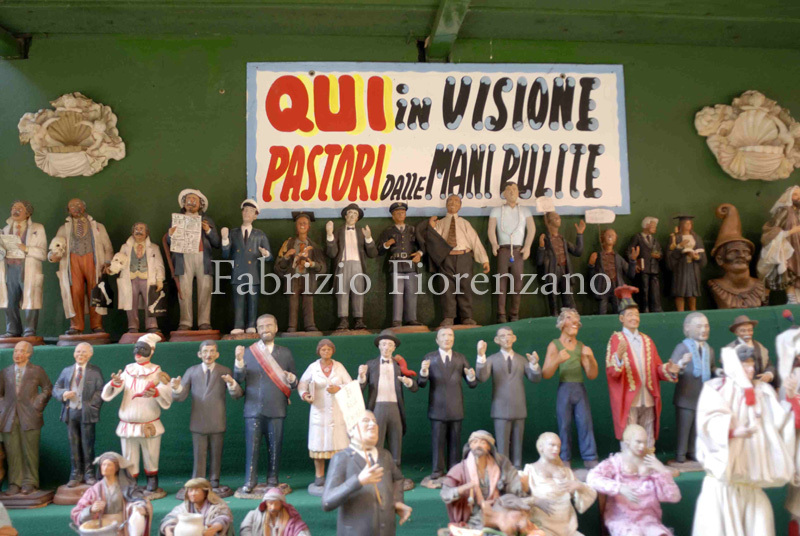 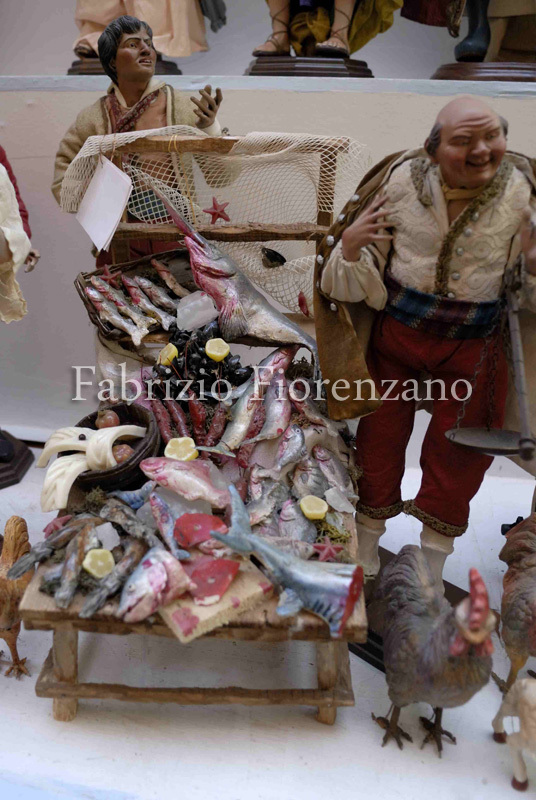 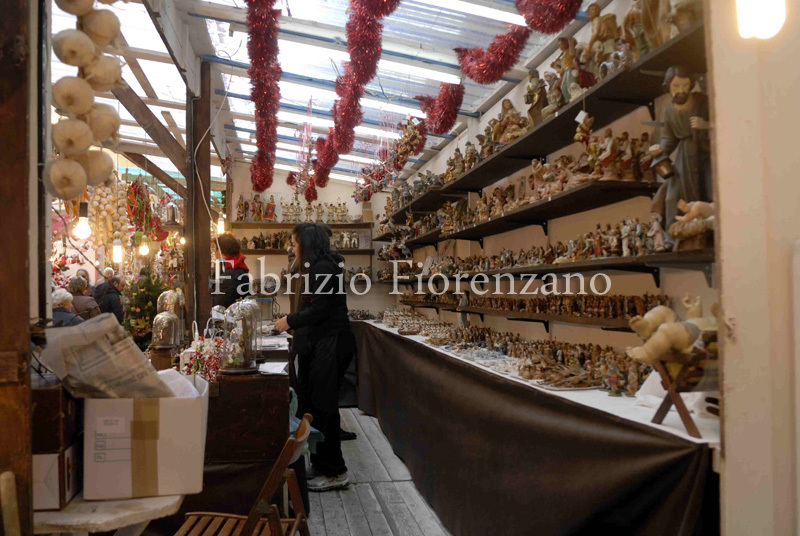 Many types of figurines are portrayed while carrying out various activities, such as fruit or fish sellers, butchers, pizza makers baking a pizza and housewives hanging the washing out of the window. 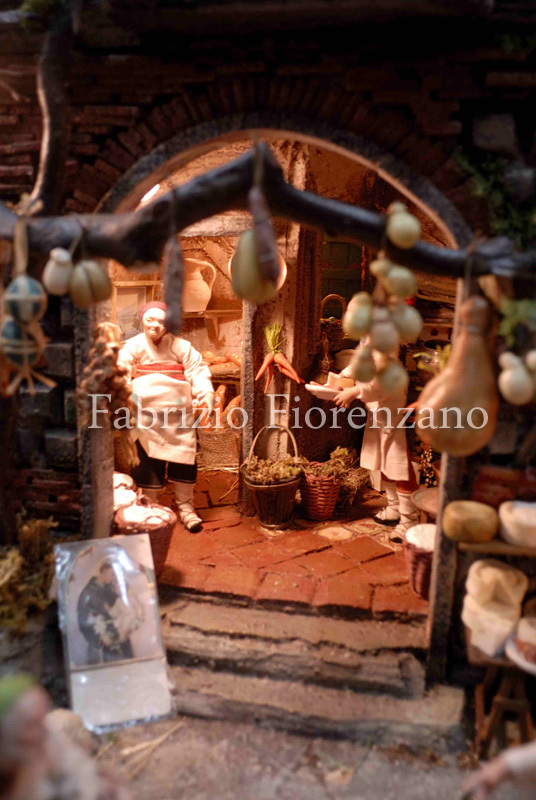 They are very accurate and even the minuscule accessories such as fruits look like they are real, if not for their size. 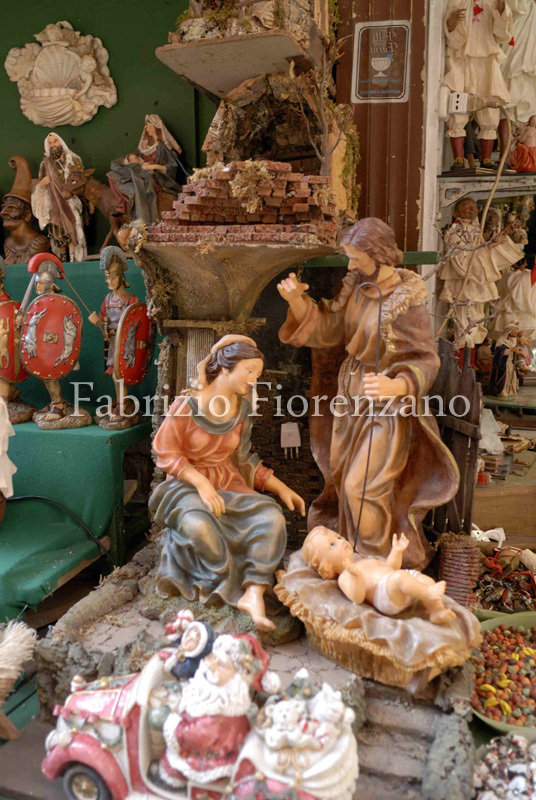 And then of course there are the classic figures of Christmas nativity scenes as the Three Kings and the Holy Family. 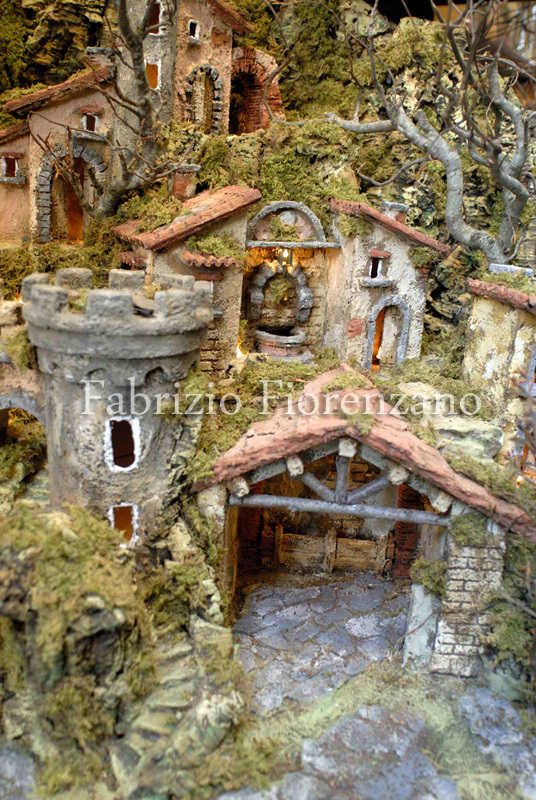 Precision and attention to details are impressive. 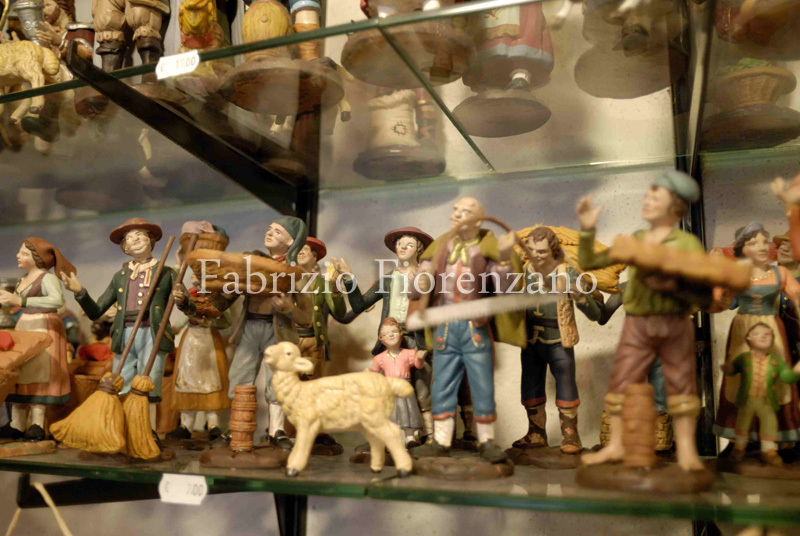 The figurines, of various sizes, are perfectly created up to the smallest detail. 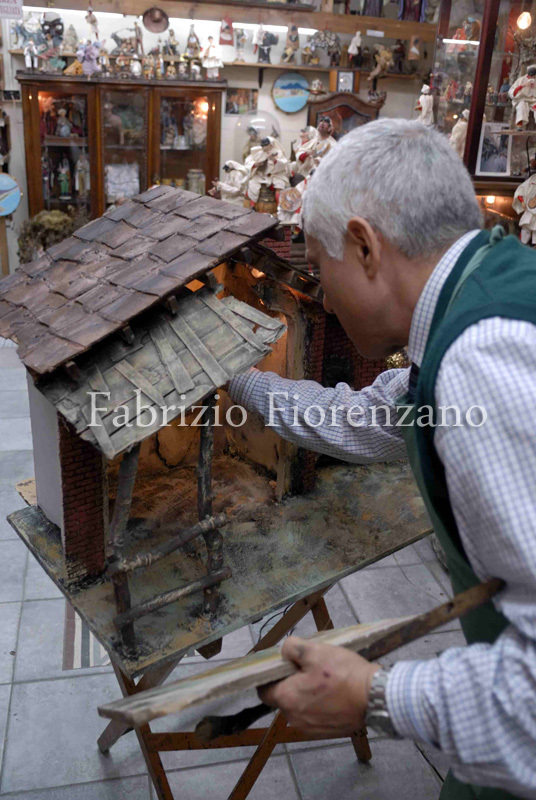 Without knowing the actual dimensions of these little papier-mâché houses, only a few centimeters in size, it could come across as being undemanding craftwork, but if you pay attention to the details you’ll see there are really minute items, almost microscopic. 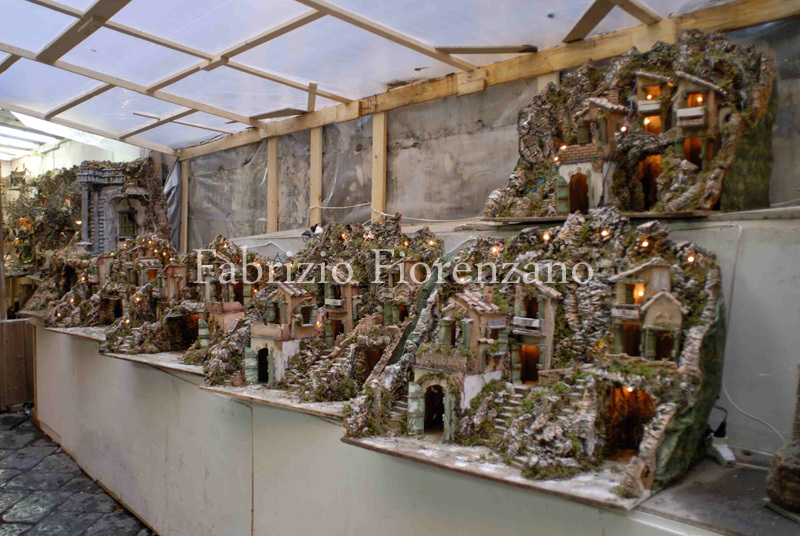 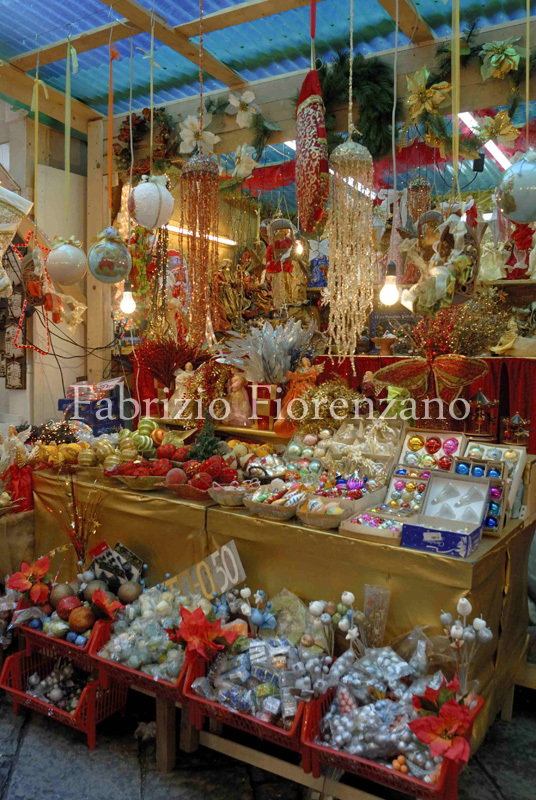 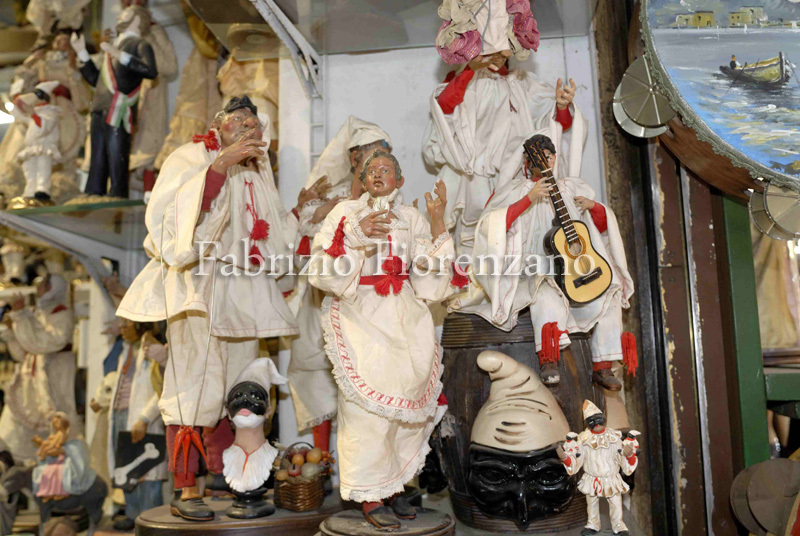 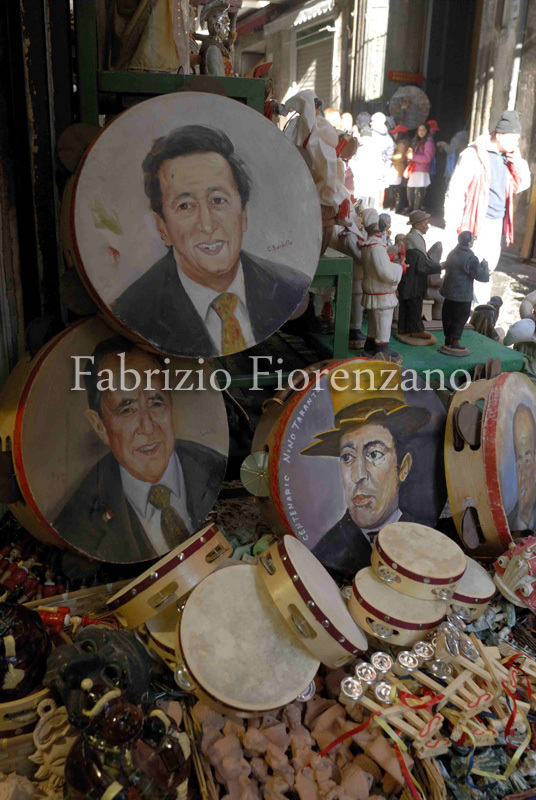 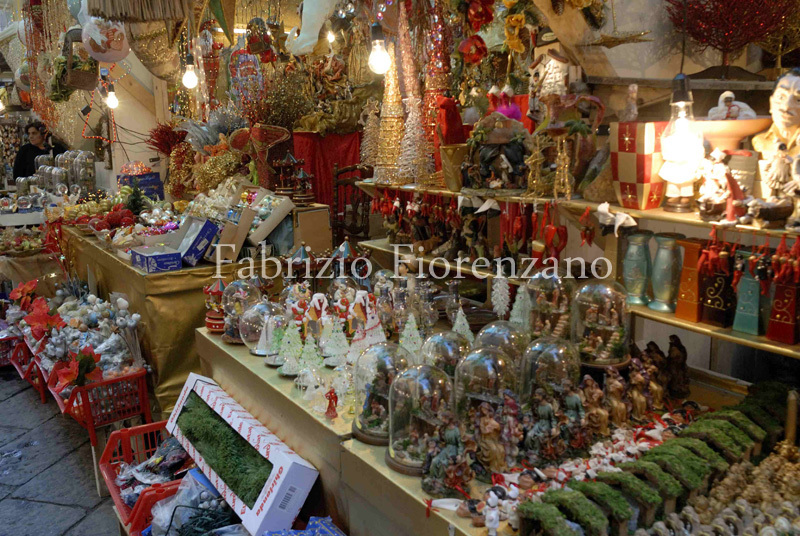 However, this is not an everyday market display: those who go to San Gregorio Armeno will be admiring art in the true sense of the word, all of which are the fruits of labour of families’ whose craft ,skill and technique have been handed down for generations. 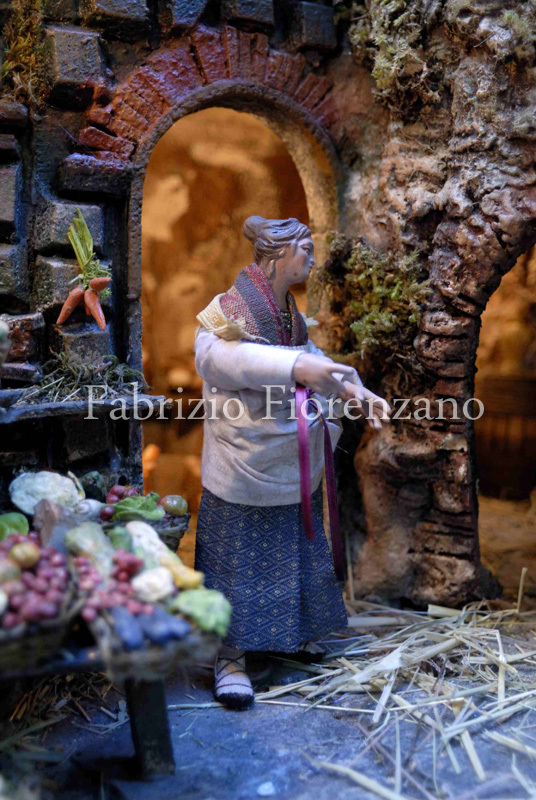 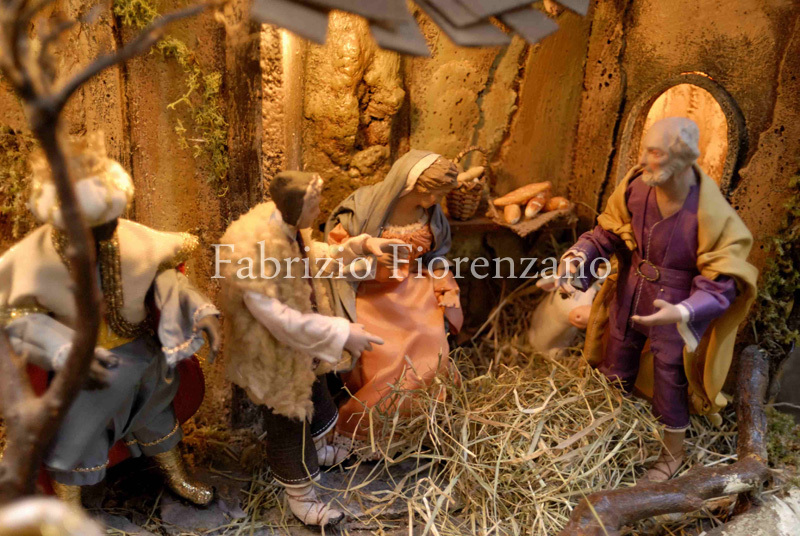 Not all the Neapolitan Nativity Scene craftsmen can spare much time answering visitors questions; they’re not being rude, they’re just concentrating and are busy working. 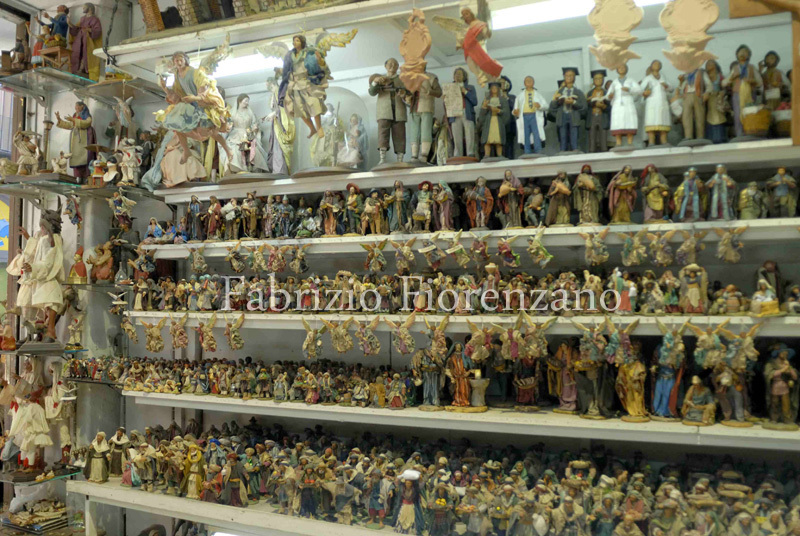 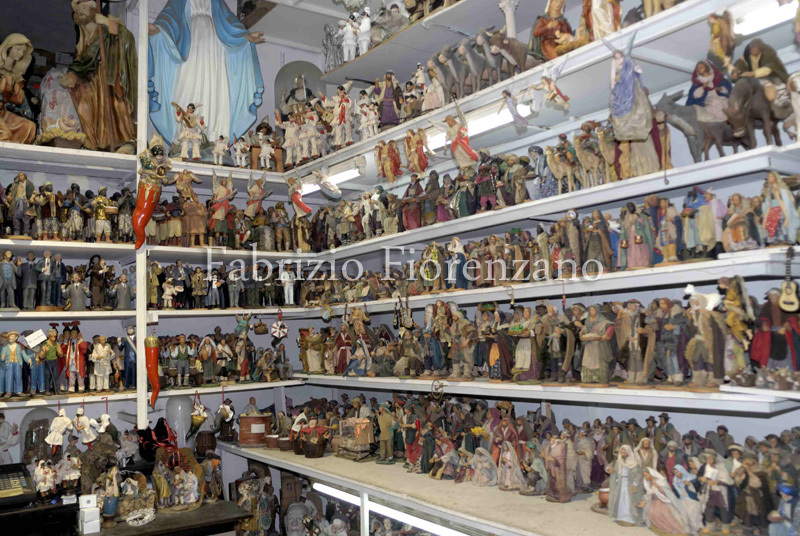 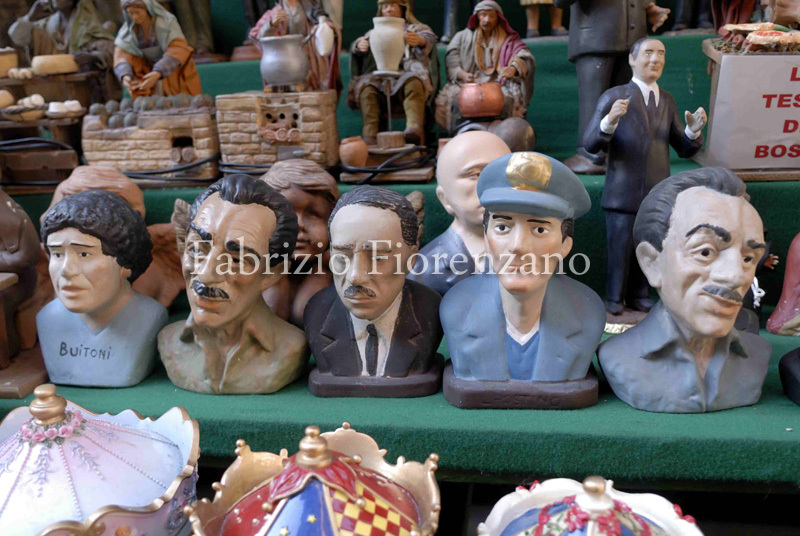 It’s almost impossible to resist the desire to buy something and leave San Gregorio Armeno empty-handed. 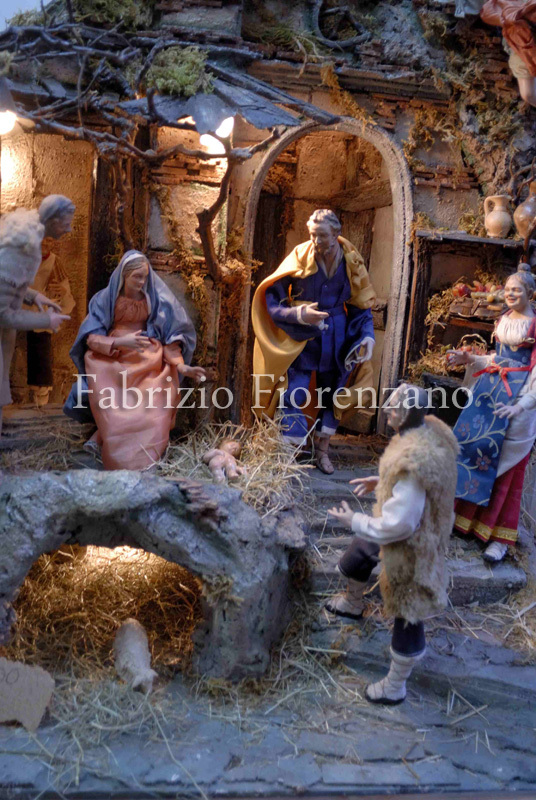 Those who want to create their own Nativity Scene can use their imagination by buying the stable of their desired size and decorating it with the preferred characters, putting them where and how they wish. 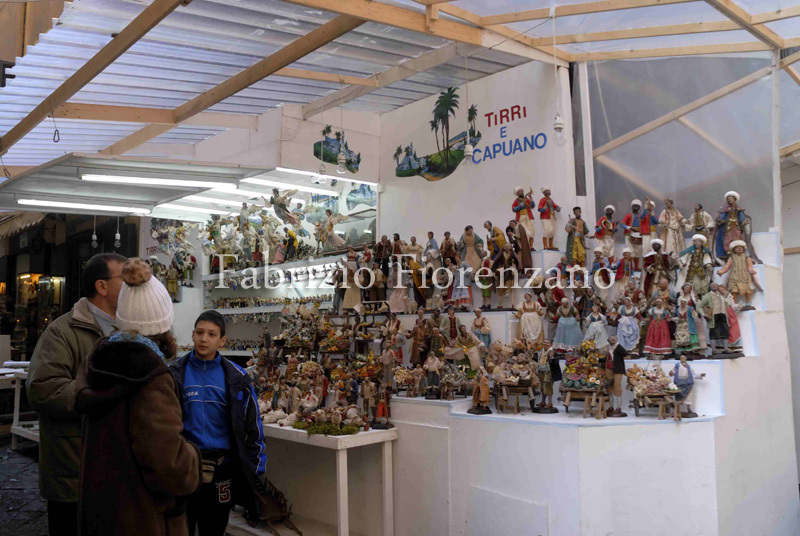 Wandering among the stands looking at the goods displayed help you to get ideas too. 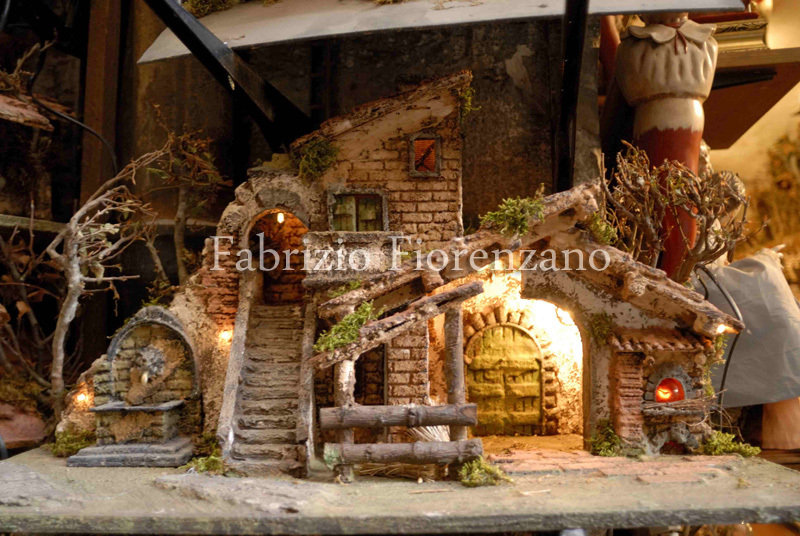 You can always copy and adapt an idea to your needs, although asking craftsmen for advice is usually the best thing to do….